Daily I find myself browsing Condé Nast Traveler for my next destination obsession. That leads to bookmarking locations and researching them, extensively. Eventually, I end up pricing out how much the trip would cost if it were to actually happen. Call me crazy but it’s the best therapy. My biggest source of inspiration, aside from this beautiful world of course, is Lesley Murphy of The Road Les Traveled. You may know her from The Bachelor (Season 17 also known as Sean Lowe’s season). I remember when she started The Road Les Traveled after moving to Buenos Aires with her boyfriend, ever since her journeys have consumed me! Her luxurious travels overflow my newsfeed- but I’m NOT complaining. Her photos are something you dream about and her writing is creative, honest, and inviting to any reader. Not convinced? This summer she went to Thailand, Switzerland, China, the Maldives, and Bali just to name a few. So follow her, take her travel advice, and try to mimic her outlook on the world- you won’t be disappointed, I promise. 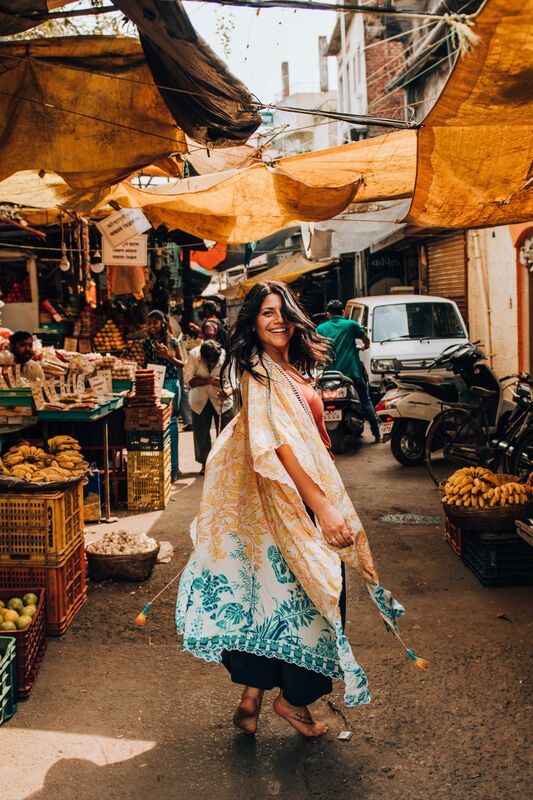 Feeling all wanderlust-y I wanted to share five of my dream destinations with you. My bookmarks folder is filled with so many destinations so you can imagine, sifting through all of them to narrow it down to five was not easy. Disclaimer: there will be mountains. The terracotta hue is what drew me in. With 229 square miles of protected land the exploring and adventure is endless. Not into hiking? Go horseback riding, canyoneering, take a UTV/ATV tour, a helicopter tour for aerial views of the canyons- or do all three. 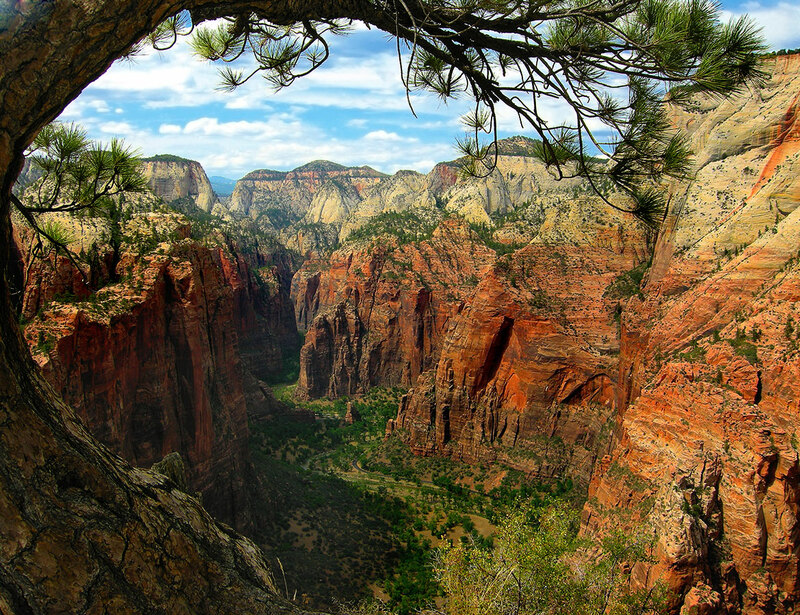 Some main attractions are Angels Landing, the Narrows, Emerald Pools, Kolob Arch, the Subway…need I say more? You would be surprised at the amount of accommodations in the area. The one that takes the cake for me is Amangiri, an Aman Resort, in Canyon Point, Utah. You can imagine how beautiful this place is. It is actually built into the heart of the Grand Circle, a southwestern region of the United States that contains the nations largest concentration of national parks and monuments. Elegantly sitting on 600 acres of land, this resort has seven different suites some with private pools, roof terraces, and every suite has an outdoor fireplace with infinite desert views. It is remote, secluded and peaceful; the perfect place to return to after a day full of desert activities. Welcome to 131,983 acres of giants. Not only are there trees, you’ll find prairies, riverways, and almost 40 miles of coastline. It is home to some of the most diverse wildlife because of its many environments. There are activities like kayaking and horseback riding or opt for a self-guided tour and hike, take a scenic drive or bike ride. Ranger-led programs are also available. A well known spot in the forest is in Leggett. The Drive-Thru Tree, also known as the Chandelier Tree. Literally a tree you drive through. Where do you stay in the middle of the forest? In the middle of the forest, of course! 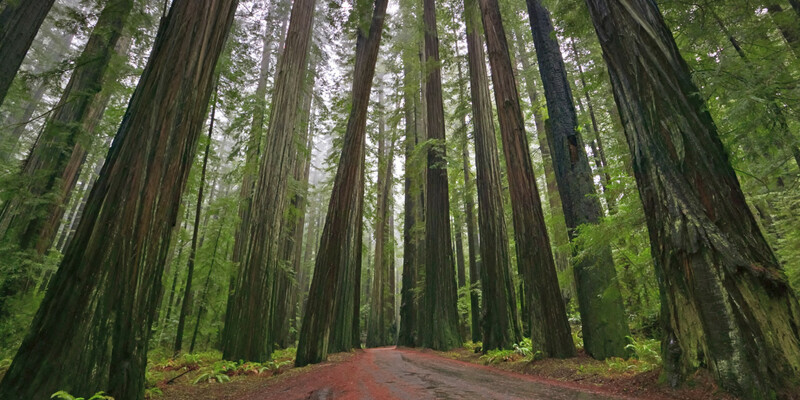 There are three campgrounds in the Redwoods each offering their own amenities. More adventurous than me? Back country camp. Make sure you are prepared, I suggest having camped before. You are completely secluded and surrounded by giants and wildlife. Taking it across the pond to a UNESCO World Cultural Heritage Site. Think Venice but built on the side of a mountain. The houses are pastel-colored and at just the right moment the sun casts their reflection on the lake below. I’ve read that 30 minutes is more than enough time to walk through the entire town and during tourist season it is nearly impossible to find a hotel room so book in advance. To get there you’ll need to take a train and at the train station a ferry greets you. Or you could drive if you’re an experienced Austrian driver. The ferry ride across the lake provides some of the most stunning views of Hallstatt. Tip: try and arrive early morning, the sun hits the town just right. There are plenty of things to do in the surrounding areas. In just over an hour you can drive to Mozarts birthplace in Salzburg, Austria or take a 20 minute drive to “5fingers” for some of the best views of the Alps. 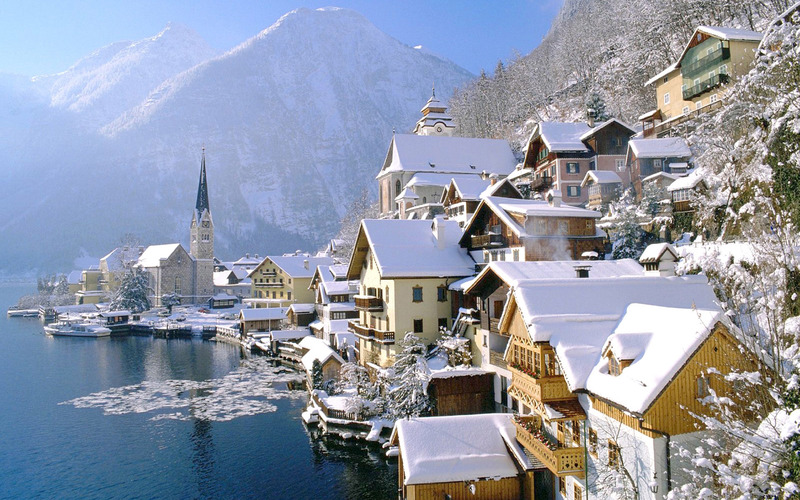 Stay right in Hallstatt and get an aerial view of the town below from the Skywalk or go below ground and visit the historical salt mines and ice caves. Keep in mind; from May to October there are driving restrictions within the town center. Going back across the Atlantic now. A gem hidden in the middle of South America, where you’ll find snowcapped mountains, azure colored lakes, pastures, forests, and one glacier. Its inhabitants are wild; ostrich, puma, and huemul (an endangered Andean deer) are just a few. 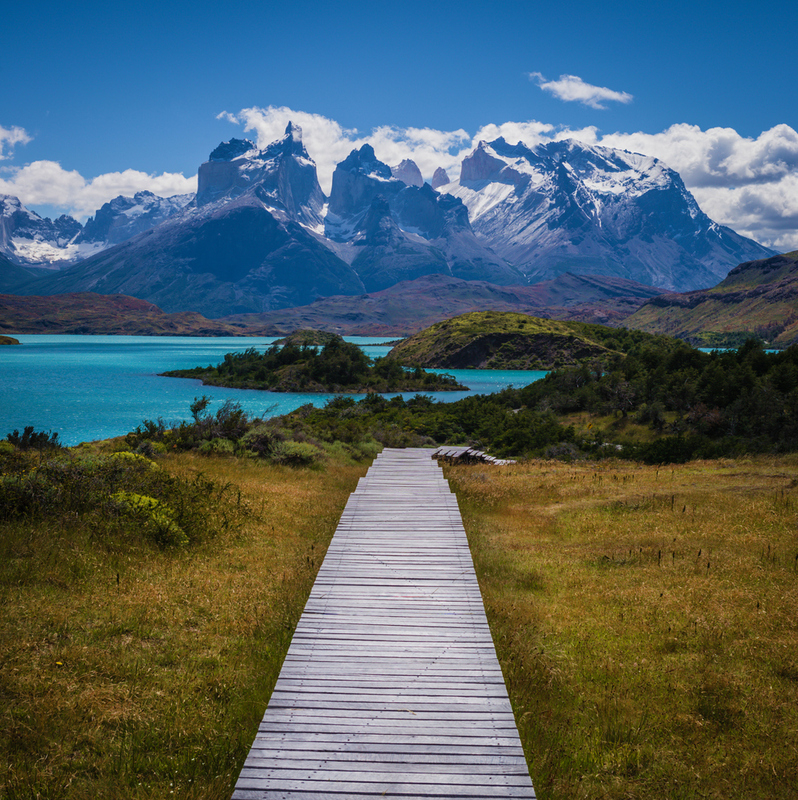 Torres del Paine translates to “Towers of Paine”- these mountains are unlike anything I’ve ever seen before, I like to think they resemble the mountains in Dr. Seuss’ “How the Grinch Stole Christmas.” Having been to Alaska, I can only imagine this kind of natural beauty. Don’t think you can take in all of this beauty in just a couple of days, plan on at least 3-7 days exploring this region of South America. There are plenty of hotels but make sure you plan ahead. A guided tour might be your best bet if its your first time traveling here. Quasar Expeditions offers exceptional tours of the land of fire and ice. You’ll be driven through the park by an experienced tour guide or drive yourself fully equipped with all of the tools you’ll need to navigate in a Jeep. I prefer adventuring at my own pace. I am one of those frequent stoppers always looking for the next pull over now moment. Their packages have all-inclusive options, so you really can’t go wrong! Each season has its advantages but I’d love to see it in the fall! What better way to conclude this post than with a desert oasis? 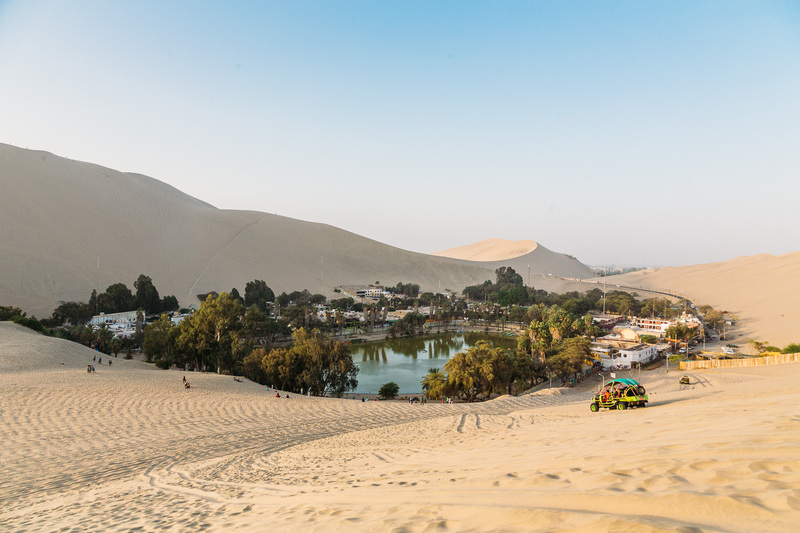 Huacachina is located five hours south of Lima and home of dune buggy and sandboarding tours. Not far from the coast, a plane ride away from the historical Nazca Lines, and endless dunes as far as the eye can see. You’ll see shades of red and yellow just as the sun sets beyond the hills with shadows of palm trees glistening on the lagoon. A true oasis. There are hotels and hostels available in Huacachina but why not go all out and snag a 5-star room in Paracas, right on the ocean. What’s better than sand dune’ing all day and returning to your resort by the sea to find a perfectly crafted, candlelit picnic? Probably nothing, nothing is better than that. Well there you have it! Those are just some of my must see places on my never-ending list. What are yours?